The goal of acupuncture is to improve “vital flow” or Qi (pronounced “chee”) throughout a patient’s body to improve the body’s ability to heal itself and return to a state of balance. 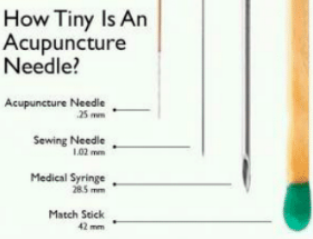 Acupuncture is the practice of inserting sterile, thin metallic needles through the skin to stimulate specific points (acupoints) on the body (for size context, see the image below). Once placed, the needles may be “activated” through gentle movements or occasionally with electrical stimulation. Acupuncture treatments typically last for 30 minutes consisting of 1 - 3 minutes of needle placement and 20 – 25 minutes of needles remaining in place (often the acupuncturist leaves the room) during which many patients rest/sleep. A tenant of acupuncture is that on the surface of the human body there are over 2,000 points that connect to 12 “meridiens,” or major pathways, that each link to a specific organ. When these surface points are properly stimulated, Qi, or energy, is released and promotes physical, spiritual and emotional balance. When something causes the flow of Qi to become blocked along these meridiens, this causes one’s organs to malfunction. Acupuncture is intended to release the blocked Qi, kickstarting the body’s natural healing response and returning it to a state of balance. As we’ll cover in the next lesson, there is evidence to suggest that acupuncture helps improve a patient’s blood flow to organs like the uterus, improves hormonal function, reduces stress, and may help regulate the body’s immune response. To varying degrees, each of these may improve a patient’s ability to conceive and her ability to carry a pregnancy. In a following lesson we’ll also address the extent to which this translates into better fertility-related outcomes. During treatment, patients may experience an aching sensation or bruising where the needles are placed. 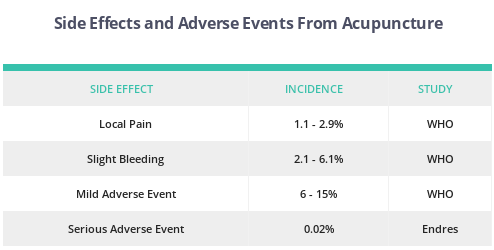 While local pain and slight bleeding often occur in the low single digits of cases, more serious events happen in less than 0.1% of studied cases. That said, some patients should avoid acupuncture, namely those who have some sort of bleeding disorder, who suffer from atrial fibrillation or lupus. Acupuncture is one tool belonging to a broader approach to improve a patient’s health called Traditional Chinese Medicine (TCM). TCM’s higher goal, just as with acupuncture, is to bring the human body back into a state of balance. Diagnosis in TCM often bears little resemblance to what we’re accustomed to in western medicine. Whereas western medicine typically labels an organ’s malfunction (e.g. “endometriosis”), TCM diagnosis the broader systemic failure (e.g. “dampness”). To address these broader, systematic issues, TCM specialists like to accompany acupuncture with the broader suite of TCM therapies--namely massage, exercise (e.g. Tai Chi), mindfulness (practice of “being in the moment”), use of herbs, vitamins, minerals, and dietary improvements. A diagnosis in TCM often bears little resemblance to what we’re accustomed to in western medicine. Ask your acupuncturist to explain how the two are related. Be prepared for your acupuncturist to recommend acupuncture in the context of also making adjustments to your diet, taking herbs, and other TCM modalities. Tell your acupuncturist if you experience low-level pain during treatment as the technique can be adjusted. More major issues are extremely uncommon.